While we have already shared a few of the fall’s hottest trends and are getting ready to share your fall essentials, you have to look at the pieces in your closet that you no longer wear, are taking up space, or no longer fit! 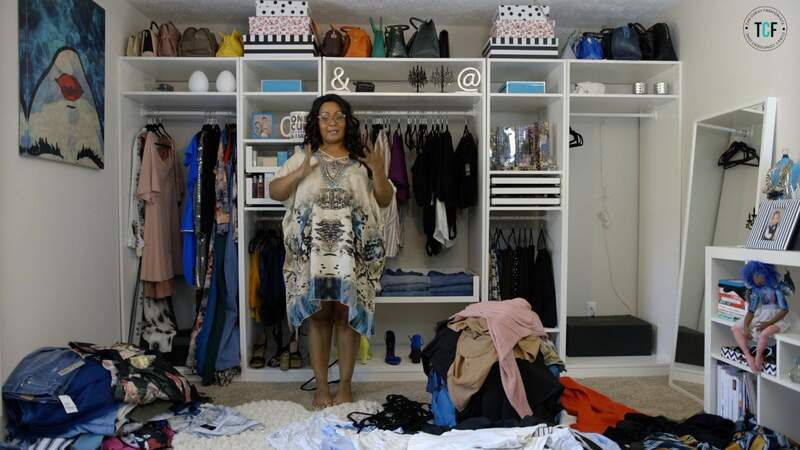 Before we brave the fabulous world of plus size shopping we must, YES MUST, tackle what is already in your closet! You will be amazed how much we tie our confidence and identity to our clothes, and THIS is okay! Sometimes, purging and cleaning out your closet can be the most painful part of your wardrobe makeover: CHANGE. I know, I know, much easier said than done right? In order to prevent the wardrobe woes and wars, we must take steps to make our closet work WITH us, not AGAINST us! And I have a few tips how to do this and I will walk you through cleaning up your closet, so that you can confidently maneuver through your style and fashion choices! Do this BEFORE you go shopping and if you can be confident and honest with yourself in your closet, you are a step closer when taking shopping confidently- the FUN and REWARDING part! Here’s How to Get Your Closet Ready for Fall! Are you still in love with it? Is it in tiptop shape for wearing? Are there holes? Are they repairable? Can I tailor it to work with me NOW? Does it match my current lifestyle? I know we all have that one pair of jeans, or that fabulous dress- you know what I am talking about! Holding onto items you are not wearing serves as a double edged sword in your fashion journey. Find yourself with a closet full of clothing you DO NOT WEAR and do not shop, because you have a closet full of clothes- right? Deny yourself the chance to enjoy your fashion aspirations, living life on pause. That is no fair to you and your curves! You need to dress your curves in the NOW moment! Some of you may have lost weight and your clothes may not fit anymore or you have gained weight and you are holding onto items until…! Either way, out of the closet it goes. You know those jeans. The ones you’ve patched and repatched? That dress you have ripped, stained, and repurposed? Yeah- those items of clothing, it is time to let it go. How many times do you go sifting through your closet and find items with the tags still on? Holding on for that amazing occasion to wear that jacket? Chances are that you will not wear it again. There is the rare chance that you may fall madly in love with it again; however, if you have not worn it yet- let it go. LET IT GO! You have to make room in your closet and life for items that love you back as much as you love it! When was the last time you went to Goodwill, or called a veteran’s group to collect the items you do not want? These companies will provide you with a tax form to use to claim on your tax deductions! Clean your closet out, help someone in need, AND get some money back in your pocket? Triple Score! Get your girls together and swap it out! I am so sure you have been eyeing your homegirl’s dress or she has been coveting those shoes you have never worn but once! Get together or attend a few swaps! Who knows what gems you will score! Do you want to reap the benefits from your closet? Take it to a resell or plus size consignment store! Ask yourself, when was the last time you did this? As each season changes, you should at least review and edit your closet once! My mother and sister always love when I do this, as their closets always see newness. At the same time, I always make sure their closets are in tiptop shape! As you go through this process, know it can be daunting, but once done, the battle is half won! Now, when you shop, you can do so smarter and not harder! By knowing WHAT is in your closet, you can then check them off with your essentials! The overhaul of your closet may reunite you with items you never knew you had or outfit pairings you never thought of! Now as you are doing this, do me a favor! TAG me on Instagram at @thecurvyfashionista, Tweet me at @mariedenee, and in our FB Community Group, SHOW OFF your Pictures! I want to see!